Advanced wear-leveling -- Lengthens drive life and preserves drive speed with a combination of dynamic and static wear-leveling algorithms designed to overcome performance degradation issues occurring in traditional SSDs that result from continual heavy use. Data integrity protection -- Protects against bit flips and data corruption from read disturb issues intrinsic to NAND media. Security -- Runs ATA-8 security feature sets and Secure Erase to protect sensitive data. Windows 7/XP/2000, Windows Server 2003 and Linux, and Mac OS. Please click Model # for Full Specs. 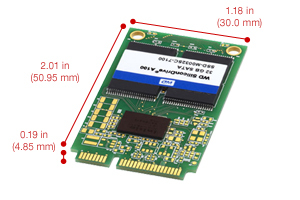 For other WD Technology's SLC solid state storage drives/cards, please go to here.